When Apart Style asked me to pick out several items for the IT girl feature, I was immediately drawn to this dress. It is a classic sheath style with pretty eyelet detail. I’ve always loved wearing white in the summer. This dress is also perfect for work when paired with a blazer/cardigan. It is 100% lined and very well-made. Unfortunately, the smallest size was still too big for my frame. This dress has gone through a major alteration. I knew my alterations would be expensive because of how complicated the dress was, but I still shocked when I saw the bill. However, I love the fit post alterations. Personally, I think it’s worth it for something timeless that can be worn year after year. I feel more confident when wearing clothes that fit properly. 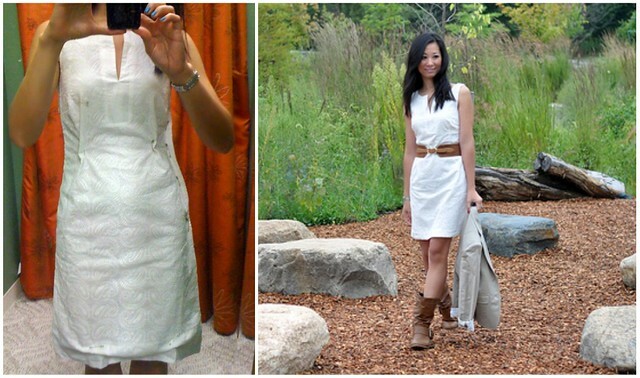 this dress fits you perfectly post-alterations and i love a good white dress!! beautiful pictures, Sydney! From that IT Girl post... I've loved this white dress and boots combination, Sydney. I guess since I've posted about dresses with cowboy boots in my own blog, I've begun to appreciate what wearing boots with a cute dress can do for you. 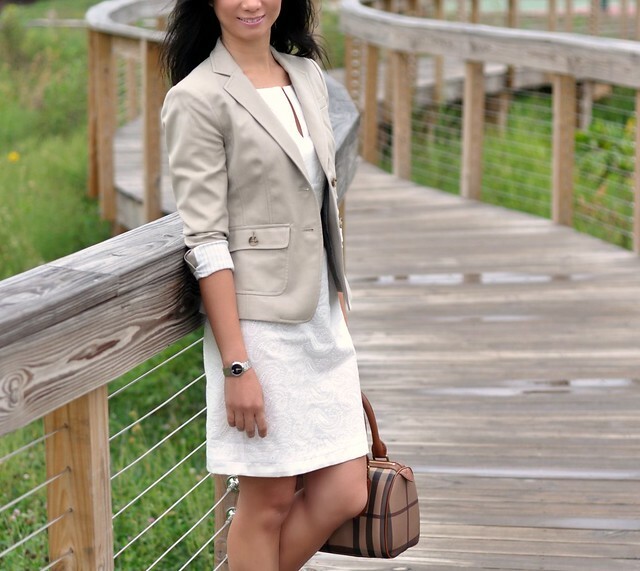 You're a beautiful lady to begin with; even more so with this outfit post. Love this dress as well as the boots. Just stunning! The weather looks so nice where you are! The dress is so simple yet effortlessly chic. I think I would love to wear such dresses and wear them to death if after alterations, it fits to a T. I love the brown from the belt and boots. Lovely! i absolutely love this dress on you and especially the first photo. I love how you pair it with the brown belt and boots! @The Little Dust Princess Jessy, I have no idea LOL =) I think I was wearing eyeshadow with a bit of glitter in it. What a perfect summer dress! And I love that belt, too - it goes so well with the dress and has awesome detailing. This dress look really good with belt. You styled it well with belt and casual boots, cute look. White dress is classic as black dress in my opinion. Gorgeous dress and great styling, Sydney! The boots were a wonderful surprise when I scrolled through the photos. Very boho chic! My Most fav look from you! Love it love it! I think the alterations were worth it and I love how you paired it with boots! would have never thought to do that! This looks so adorable with the boots! Beautiful pictures! Looks so good especially with the boots! Great way to transition into Fall :)! Your tailor did a beautiful job on this dress because I can't tell any work was done to it! With lining, I am sure it was quite a pricey job, but I think it is perfect! Enjoy and you look fantastic! Your photos are beautiful! And I love the white and brown and khaki together. The eyelet dress looks beautiful on you - you look elegant and chic. I love the subtle detailing on the dress so it's simple, but unique at the same time.